Our article was updated and now includes also a review on Grammarly Mobile Keyboard. Did you already know this app? This is new to you and you can't wait to know more? Check our review below. Why do I need a proofreading software? I will provide the answer to this broad question with a confident and compelling argument. Whether you do writing for a living or as a hobby, what are the most important aspects you want to ensure in your writing to ensure its proficiency? British or American English spellings consistency, correct punctuation, eradication of significant errors like comma splice errors, immersive sentence structuring and many more aspects like these right? However, unsurprisingly it is human nature of having a deterrence and hesitation towards checking one's work for errors. After spending a lot of quality time on a piece of work, a human's nature starts to believe that the job done is one of the best parts of writing ever done and at this point, the work of a critic is essential. It is vital because a critic forces the author off his high-horse position and lets him or she finds out the negative aspects of their writing. "In many ways, the work of a critic is easy. We risk very little, yet enjoy a position over those who offer up their work and their selves to our judgment. We thrive on negative criticism, which is fun to write and to read. But the bitter truth we critics must face is that in the grand scheme of things, the average piece of junk is probably more meaningful than our criticism designating it so." Grammarly also offers integration into Microsoft and Google software like MS Word and Google Chrome as a plugin. Now it might raise a question in your mind that what is the use of this software as a plugin for a web browser? The simple answer to this is that improvement in your quality of English comes from grass root level. It is not necessary to be a professional author or have writing pieces to check your common mistakes. Even a message to your mom or dad or any family member might contain small errors, which if corrected and learnt from lead to significant improvement in English skills. Did I make a mistake in the last sentence? Many of you might have thought that the word "learnt" is not correct whereas others might have thought that is it correctly used. The dilemma is that "learnt" is a British English spelling and with consistency with other spellings that I have utilized in this article, I should rather use the American version which is "learned" not "learnt", Grammarly pointed this inconsistency issue through the Chrome Plugin. Realized how tricky English could be? Why not the built-in Word processing software's grammar and spelling checkers? It should be clear in my reader's mind that the autocorrect and spell-check tools most word processors have are great, but they only amount to a single line of defense. There is various software for proofreading and plagiarism checking like Ginger Software, Proofread Bot and much more so why particularly Grammarly? Is it worth the claims? 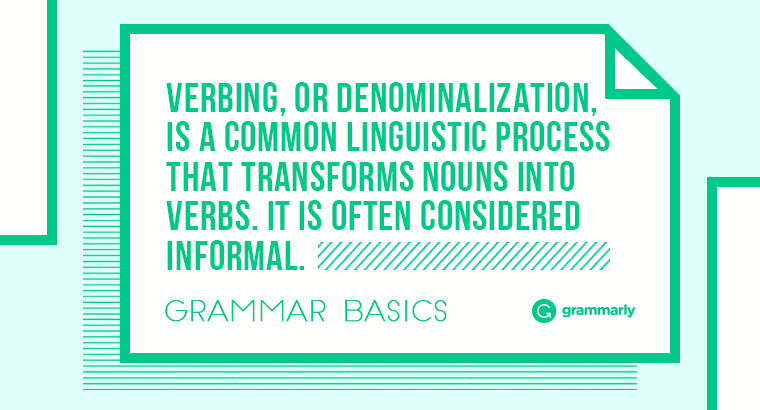 Let us see and discover more about Grammarly. What are the various products and plugins Grammarly offers? Grammarly work with different kinds of platforms. Therefore, it is a great resource if you need different supports to write your piece. Besides that, the software use is really simple and everyone of this products. To start using Grammarly, you first need to understand and think about your needs. What tools do you need to write your text and how many features are necessary to upgrade your text. What are Grammarly Free features? 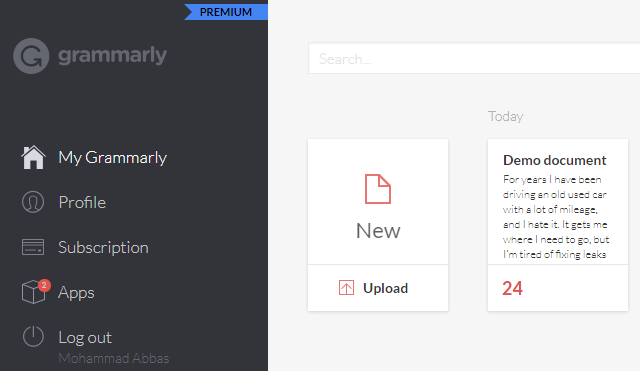 What are Grammarly Premium features? Let me walk you through the process of using Grammarly Chrome Plugin, and the rest of the plugins work much like that. After installation of Grammarly Plugin for Chrome, you get the option to form a free account. As soon as you make this account, you get your dashboard to customize your Grammarly according to your needs. Although some features are not available at this point in Grammarly Free but the option to switch between American/British spellings and a personal dictionary is awarded to add any word that you are sure is right, but it is not in the dictionary of Grammarly. As you can notice, the yellow colored subscript says "Advanced Issues" but it asks for an Upgrade to the Premium version. Till the stage of Grammarly Free plan, everyone might admire its capabilities, but when a payment plan is involved, it becomes necessary to have a crystal clear review of the pros and cons of this software. "One machine can do the work of 50 ordinary men. No machine can do the work of one extraordinary man." Therefore do not expect that it can replace the intelligence of a proficient human proofreader. However, in comparison with other proofreading software, it offers intuitive and comfortable correction process with more than 250 types of grammar mistakes in six distinct writing genres along with plagiarism checking. Its exclusive features include Grammarly informative flash cards which are based on the common writing mistakes you make. Moreover, the Personal Writing Handbook on the dashboard of your account provides a comparison and track record of the grammatical or spelling errors made in each piece of writing. This allows you to have a look on your progress in learning from your highlighted mistakes and not repeating them in your future work. A good record keeping book indeed. Having identified the first exclusive feature, let us look at some features not as proficient as they are claimed by Grammarly. The first one is the document identifier. This feature helps identify a piece of writing as a letter, blog post, article, email, etc. I used this feature to identify many different pieces of writing, and unfortunately, Grammarly got confused between various types of writing and often wrongly identified. Related to document identification, there is a particular niche of writing where Grammarly lacks. It is in fictional writing checking. Fictional writing is more prone to grammatical mistakes, and unfortunately, Grammarly overlooked some errors. As a solution to this, Grammarly offers human proofreading services at $0.02/word but as argued by many including myself, why should we pay for human services of Grammarly which claims accurate virtual proofreading services. How to add and work with Grammarly and Microsoft Word? Well, let’s imagine that Microsoft Word is your top work tool and you write a lot in English but this is not your first language. Grammarly is a really effective and simple tool that you can add to Word. Let us explain. The first and most important thing that you need to check is if Microsoft Office and your operating system are compatible with Grammarly. The software is compatible with Windows 7, Windows 8, Windows 8.1, Windows 10 and Microsoft Office 2007, 2010, 2013 or 2016. Do you have one of these? Great, you can install Grammarly and you are ready to work. Change the default settings and you will be able to check your account information, change the dictionary, update your profile settings and even enable Grammarly for new documents. After comprehensively checking this feature, I found out that Grammarly correctly identifies obvious flaws in spellings. Some examples are "cource" instead of "source" and "riting" instead of "writing". However, where it got confused was in the use of it's and its. It did detect this error, but while it highlighted the incorrect use of ‘it’s’ in the final sentence, it suggested ‘it has’ rather than ‘its’ which was not correct considering contextual spellings. One of the most common and major grammatical mistake writers make is of the comma splice. I checked this feature by various sentences so I would use a sentence example to evaluate this feature. Example: "My mother told me that she remembered her teachers, Susan and Maria, she could tell you how their voices sounded when they was happy?" Now this sentence contains a mixture of very definite and complex errors. 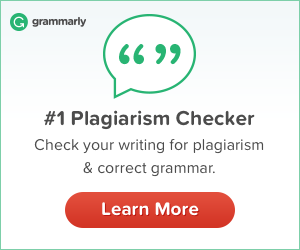 Common errors in this sentence that Grammarly detected easily are a comma splice (. . . Maria, she . . .), use of the wrong tense of the verb “tell,” and an instance of subject-verb disagreement with (they was). Grammarly gave correct recommendations for replacing comma splice by semicolon or adding an "and" after the comma or replacing the comma with a period and capitalizing the word "she". Similarly, Grammarly in the morning replacing "told" with "be told" or "tell" and replacement of "was" by "were". However, on the contrary, the place where Grammarly failed to satisfy is the detection of the question mark error at the end of the sentence. Moreover, at some other stances, I found out that Grammarly got confused in placing a comma in a list of words. It got confused in a list of names, things and suggested commas even if there were only two persons or things involved in a list. Let's again use some examples to test this feature because short examples are helpful to qualitatively evaluate. The example of a short sentence is: "Having done the computer homework, the movie cast would begin". Evaluating this sentence, Grammarly correctly identified the error of a dangling modifier i.e. "Having done the computer work" doesn't relate to "movie cast." However, in this case, Grammarly did not offer any recommendation and just asked to consider rewriting this to avoid the error. Moreover, the use of full stop should be before or after speech marks. This question will be a source of confusion for many of my readers I believe, but the rule is: In American English, the full stop is placed inside the quotation marks and in British English, vice versa. However, Grammarly failed to identify this error based on American or British English, and it allowed both options without pointing out the confusion. The next instance to check Grammarly was comparison error checking. Take the sentence: "Maria's grades were better." Grammarly correctly pointed out the comparison error in this sentence and stated "better than whom" with a missing comparison object or person. Now I checked if it catches wordiness, incomplete sentences and unimpressive sentence structural flow and Grammarly caught it with a sharp eye. I am not mentioning the whole of the long paragraph which contained wordiness in a lot of aspects but just evaluating honestly what Grammarly caught greatly by a small example: "Had a breakfast in the morning." Grammarly impressively pointed out two major mistakes in this sentence. First is the incomplete sentence structure about (who?) had the breakfast. Second is the wordiness issue i.e. breakfast is presumably in morning, so there is no need to write "breakfast in the morning". 1) The flock were flying. 2) John had a nap. 3) I will go there at the weekend. 4) This sentence is different to the last one. 5) I liked the flavour and colour of it. This is a point where I doubt the claims made by Grammarly to a great extent. As you can see, the examples contained no complex American/British English inconsistencies and therefore, if Grammarly claims to check whole articles or essays for inconsistencies, it may be an exaggeration in comparison to failure to identify American/British errors in simple and short sentences. "Our plagiarism feature compares your content against a library of over 8 billion web pages, so you'll never have to worry about unintentionally borrowing content." Having said this, I was skeptical of such a claim and decided to scrutinize this to a great depth to measure value vs price of this software. I started by copying a long paragraph of an article from www.economist.com and amazingly, Grammarly detected the content to be 100% plagiarized. Following this, I used some excerpts from less-commonly known websites and Grammarly impressed by detecting all plagiarism yet again. However, the darker side came when I changed just a few words in the same copied paragraph and Grammarly then resulted in giving a 0% plagiarism report. I did not expect this in a rather expensive virtual proofreader and plagiarism checker in comparison to its peers like Ginger software at just $89.88/annum.The purpose of all these individual checks was solely to aid my readers to make a right choice. Hard earned money should be spent wisely, and for that, everyone needs a first-hand and honest review. --> Realistically, Grammarly can solve 65%-70% of overall writing errors. --> Plagiarism checker is good but not artificially intelligent to detect deep plagiarism. But what is great about Grammarly is the Money Back Guarantee of 7 days. Thus, if you are buying Grammarly for the first time and if you are not impressed by what you get in first seven days, then without any inquiries, the money is fully refunded. Nowadays, people use much more smartphones to do everything. If you are one of this people and want to take advantage of Grammarly in your smartphone that is possible as well. Recently, it was launched an app available for iOS and Android. The white keyboard is really simple. It has dark letters and checks everything you write automatically. To switch the keyboards while you are using different apps, you just need to tap the globe icon. Grammarly can be used in any app that needs a keyboard and you can even use it on Google Docs - that is not possible on your computer. If you choose the free version, it will check grammar, spelling and punctuation mistakes. On the other hand, the Premium version gives you more advanced word choice options and other style improvements. On the other hand, Grammarly keyboard has space to improve. With some keyboard themes, gesture typing and other features with more usability it can become a keyboard not so basic and gain more fans. 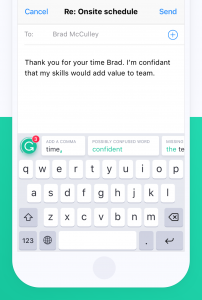 Grammarly app is great if you usually write e-mails, create social media posts and other documents or communicate in English with your smartphone. • If you have ample amount to spend on a proofreader and plagiarism software and the amount is sleek for you, go for it. It helps eliminate at least 65-70% errors in your writing and helps you join the learning process through flash cards and Personal Writing Handbook. It also allows correcting spelling slip errors which are common after getting tired doing a lot of writing. However, do not believe that after Grammarly has checked your writing, it is a perfect piece of writing. Do check it manually. Believe in the power of the fastest computer=brain! • Remember, Word Plugin of Grammarly is only available for Windows and Mac users still have to wait for this feature on Word. • If the amount seems heavy according to your budget, do not spend this much amount. Go for the basic Grammarly Free version and just point out critical mistakes with its help. Having some thing is better than nothing. Check out the video and comment in the section below on what you think of this software. Tell us if you already use Grammarly and how the experience was for you. If you never used it and you're willing to try, go for it. Happy Writing!